I am Raja — the exotic, adorable, and super fun playmate you’ve been searching for! I am a 5-year-old lady cat that is full of energy and excitement, and I just LOVE to hang out with anyone who stops by to say hello! I love to have my chin scratched, I play with lots of toys, and I am a champion snuggler. My loud purr makes the bed vibrate! I am a gorgeous cat with a lot of traits similar to the Japanese Bobtail, including my short little 1/2 length tail that I sport. Like the Bobtail, I have a very family-friendly personality and very little undercoat which means that even though I have longer hair, I hardly shed at all and don’t require a ton of brushing, though I do appreciate a good brushing if you have the time! I am very confident and would probably do great in a household with kids as well as a dog or two. I’m very smart and curious, so my ideal home would probably be with a family or a couple people who have a lot of time to hang out with me — either dragging a string across the floor for me to chase or chilling and watching TV on the couch, I just like to kick it! I’m a very hearty cat, however I do have chronic congestion which will likely last the rest of my life. It definitely doesn’t slow me down! I take a pill twice a week called Cerenia that seems to help a lot and I’m extremely easy to pill. I will need annual vet visits like other cats and may be more prone to kitty colds than other cats, but my looks and fabulous personality MORE than make up for my semi-special needs. 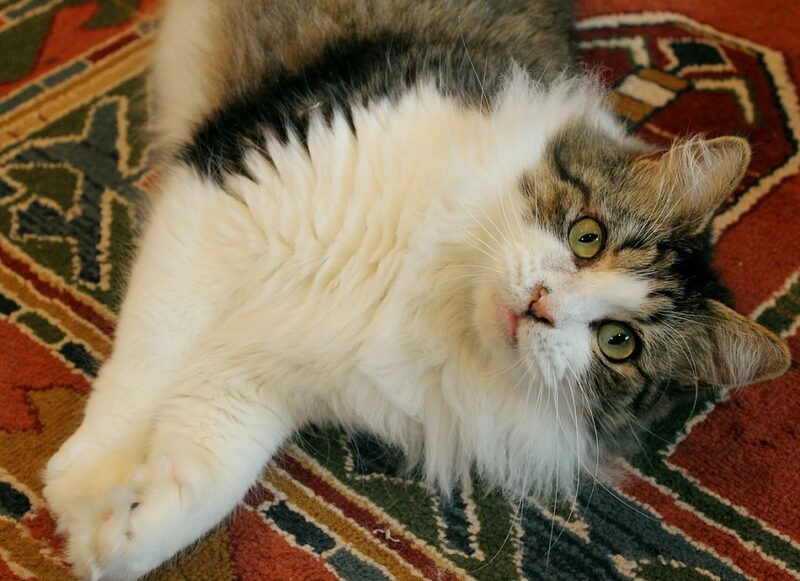 I can’t wait to find my forever family — are you looking for a cat like me? Stop by Pixie to meet me today! I come to you fixed, vaccinated, and micro-chipped for an adoption fee of $100.